← Introducing the Capitol Reef Trail Guide! Reaching the Rock Bridge trailhead requires exiting the Bert T. Combs Mountain Parkway at exit 40, then cutting north through the small community of Pine Ridge on Routes 15 and 715. Route 715, while paved, is very narrow and (at least as of April 2015) lacks a yellow lane divider. Four-tenths of a mile from the start of Route 715, after passing over the highway, turn right onto Rock Bridge Road. This drive quickly leaves the pavement and cuts into the forest. Follow Rock Bridge Road to its end, three miles from the turn. A quaint wooden sign, near the start of the short loop drive around the Rock Bridge picnic area, marks the beginning of the trail. 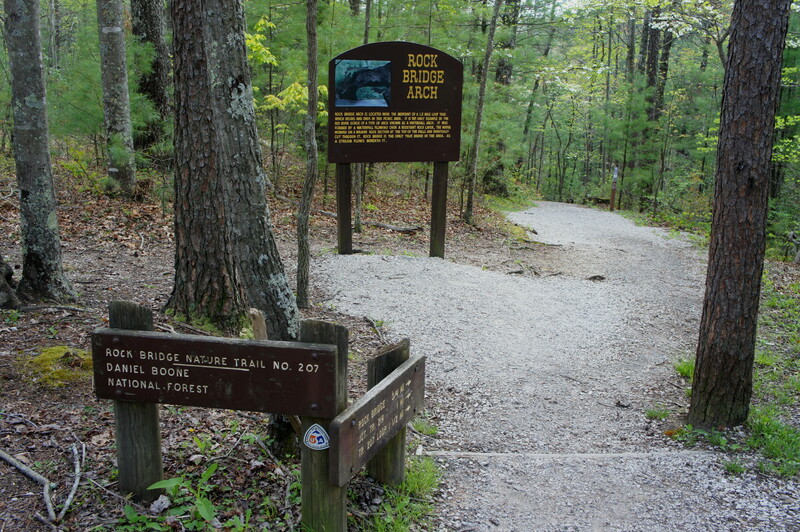 Officially, the Rock Bridge loop is Daniel Boone National Forest Trail #207. Much of the Rock Bridge loop is actually graveled or partly asphalted, but alas, it is far from wheelchair accessible. Nearly immediately, the trail descends a knee-buckling grade, followed by a series of stone steps. 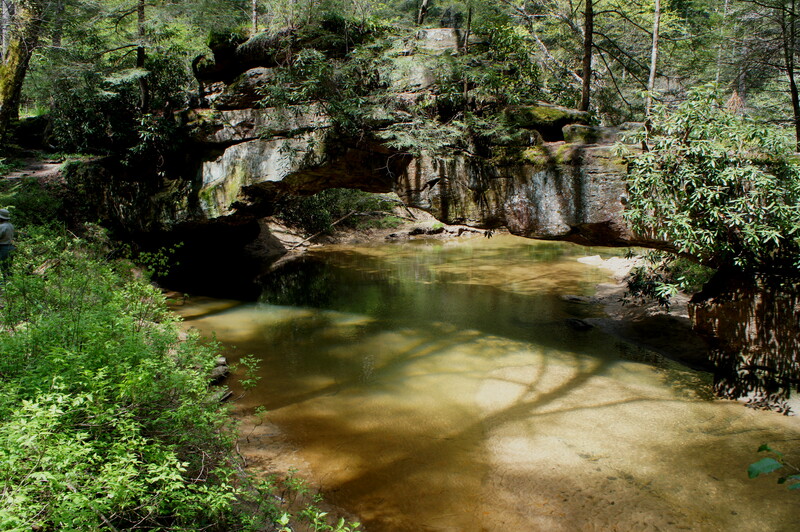 From here hikers drop into a rocky hollow, traverse a small footbridge, and encounter an impressive, cave-like overhang on the right colloquially known as the “Rock House.” Beyond, the trail continues to descend steeply to the north bank of Rockbridge Fork, here flowing gently and peacefully downstream to meet Swift Camp Creek. The forest here is dense with rhododendron, broadleaf magnolia, laurel, and hemlock trees. 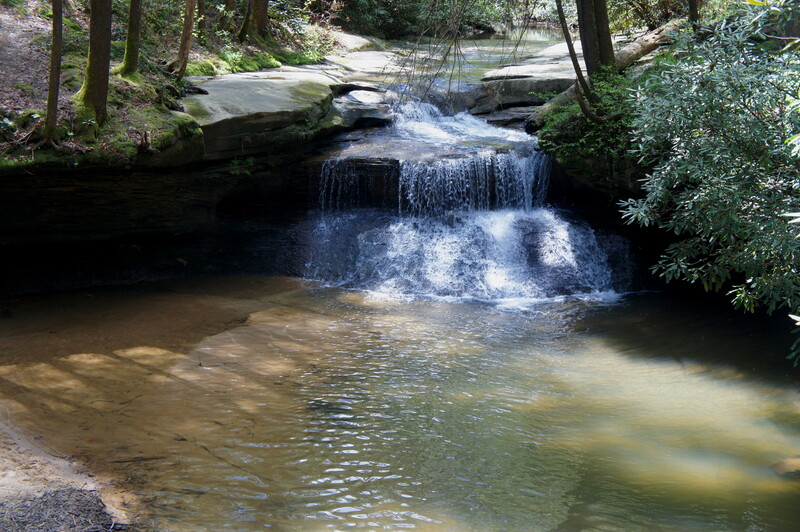 The trail briefly leaves the stream as it ascends the side of a slope but quickly returns to the creek at Creation Falls, a multi-tiered,12-foot cascade that ends in a small pool. Continue onward for a couple hundred feet to find the best access point to descend to the rocky beach at the foot at the falls. 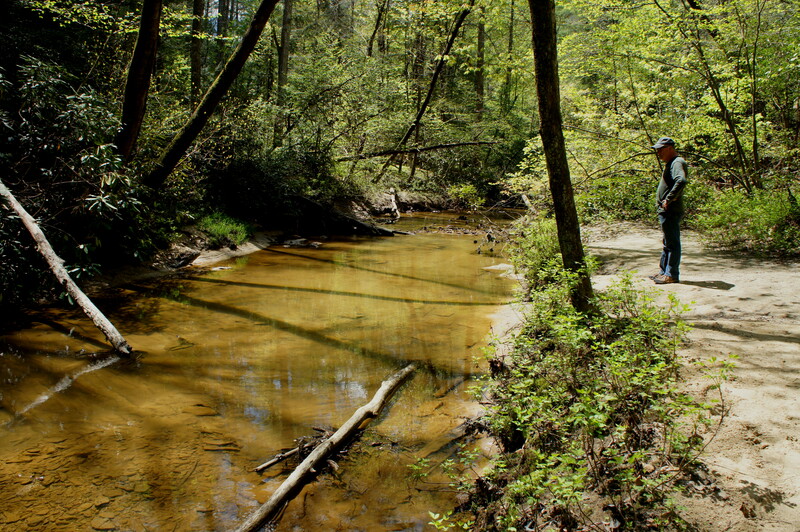 Beyond Creation Falls, the trail takes a hard left and offers the first view of Swift Camp Creek, which enters from the south. Straight ahead to the north is Rock Bridge. 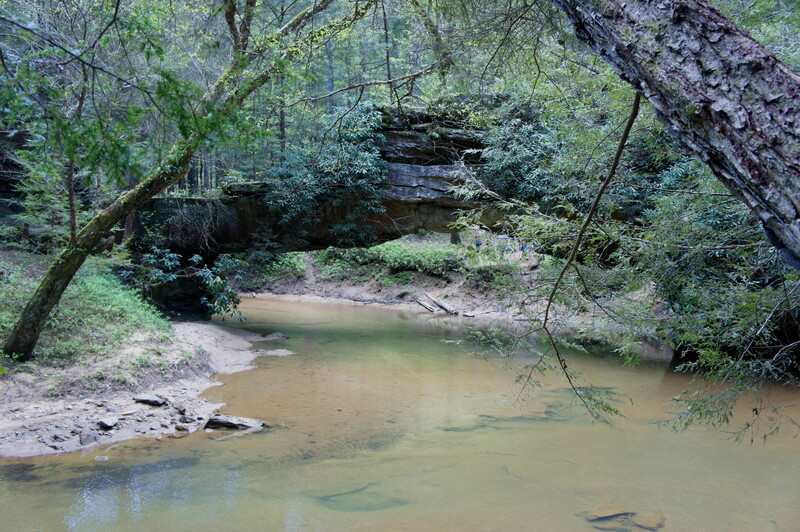 Covered in mosses and spanning perfectly still, yellow-green waters, the natural bridge has a sort of mystical flavor. It is possible to traverse the bridge; use caution, of course, and do not attempt when wet. Stop for a snack at the arch or in the shady hollow just beyond it, just before the trail begins its ascent back to the trailhead. The ½-mile climb to the parking area is broken up by fleeting views of the valley around, as well as a couple wooden benches. 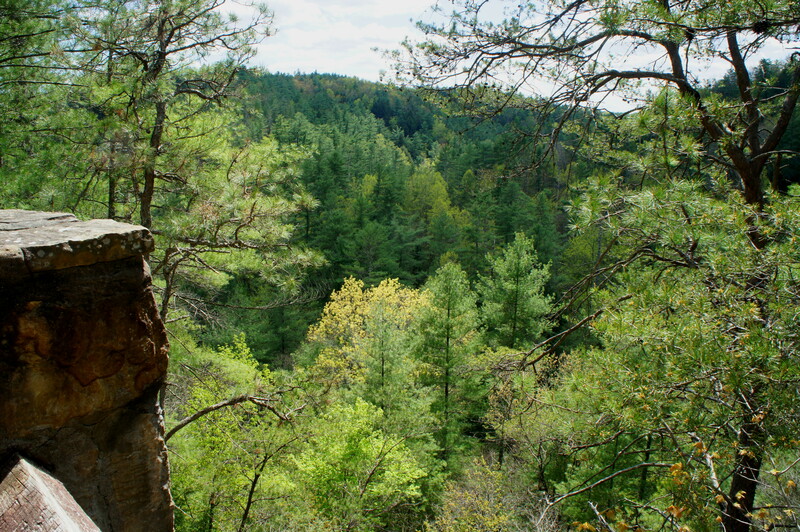 Roughly 1/10 mile beyond Rock Bridge, the more strenuous Swift Camp Creek Trail (TR #219) takes off to the right. With about ¼ mile left, the incline eases and makes for a relaxed and pleasant return to the picnic area. The trail spits out on the opposite end of the loop drive—cut across the picnic area (past the bathrooms) to complete the hiking circuit. 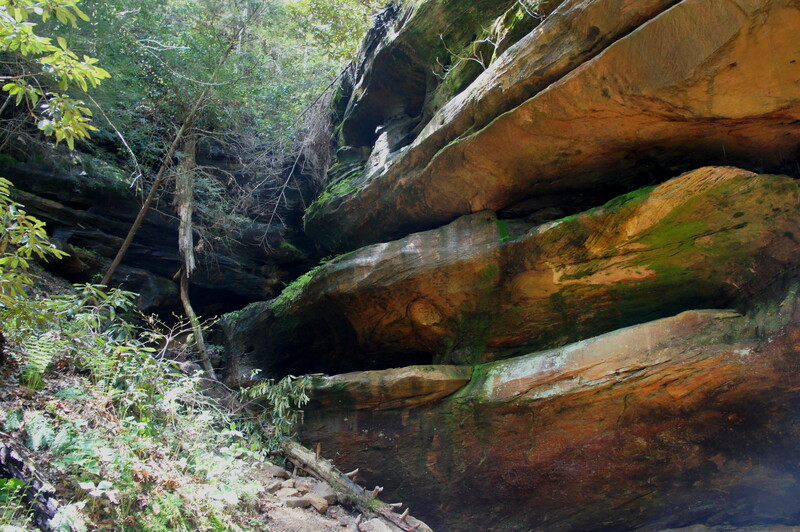 This entry was posted in Daniel Boone National Forest, Kentucky, Moderate Hikes and tagged arch, Creation Falls, Daniel Boone National Forest, Kentucky, loop hike, natural bridge, Red River Gorge, Rock Bridge, Rock Bridge Loop, Rock Bridge Trail, Rockbridge Fork, Swift Camp Creek, waterfall. Bookmark the permalink. Now this looks like a super easterm hike. Lots of water and rocks:) Too bad it isn’t longer. I think this is the one we did but it was over 10 years ago. 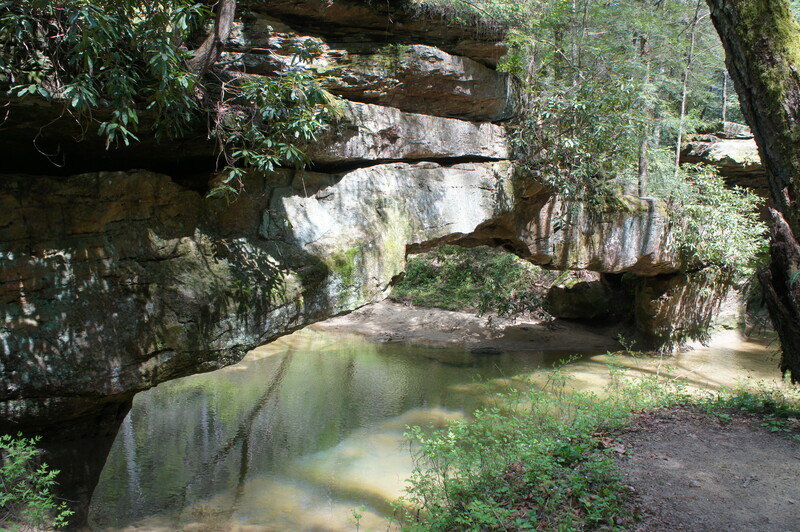 It was a bridge in red river gorge but I can’t remember.